What a difference a year makes! 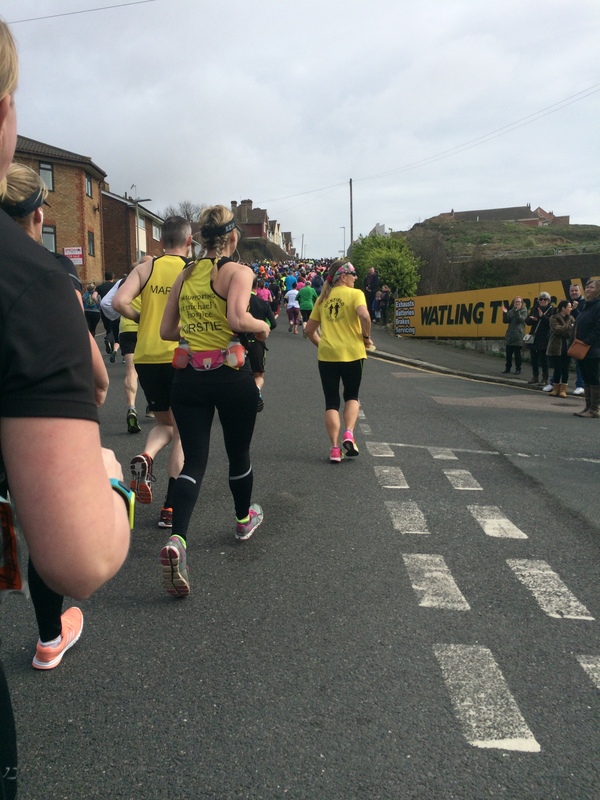 Last year I did the Hastings Half Marathon, it was my first ever big running event, and I was woefully unprepared for it, although it was an important step in my training for London. At the time I said I’d never do it again. It was just too hilly. Yet, here I was, back again 12 months later about to tackle it once more. I wanted to prove something to myself. I wasn’t happy with my time last year even though I felt immense pride at having done it. I had a score to settle with it … and today settle it I did. My time was a cool 32 minutes 26 seconds faster. Bloody fantastic, and so much better than I could have hoped for. Not only did I beat last year, I only went and set another PB, my third half-marathon best in four weeks! That wasn’t meant to happen. Not today, not with those hills. So, what happened? Most of the climbs came in the first five miles and some of them were brutal. I tackled them as best I could but I was also mindful that I needed to conserve some energy for the latter part of the race, so I decided not to be a hero and took them as easy as I wanted. I did run them as best I could but once I started to feel the burn in my thighs I eased off again. I was slightly disappointed with my time after 10k, not massively so, but I knew if I repeated that in the second half then my overall time would be nearer 3 hours. As with last year, Queensway was a real challenge. It steadily rises for around 3 miles, almost bereft of spectators and comes after the Harley Shute Road which itself is considerably steep. Then, from nowhere, I went into full-on beast mode! Something kicked in. I completed the second half of the race around ten minutes quicker than the first. Yes, it wasn’t as hilly but that’s not to say it wasn’t without it’s climbs, it was, and some of them quite nasty too but I charged up them. I was passing people that had passed me earlier in the race, and made it a personal goal not to be passed by anyone else for the remainder, and I don’t think I was. If they did I caught them again. For a mile or so from around 8.5 miles the course is a steady drop and I sprinted past so many other runners … and even on the flat sections I wasn’t letting up. I just found all this energy from somewhere. Then the course drops down onto the seafront and it’s a straight three mile run to the finish, more or less. By this stage I was recording faster kilometre splits than I had on Friday in Belfast and that was only a 10k race. I had no idea what was happening, but it was happening and I was making the most of it. Being a seaside town, the wind naturally comes off the water and this made it quite challenging at times to run. So, rather than compete against that, I walked when the wind got too strong, hoping to make up the time when it eased. I knew I was in with a chance of a PB by now and that kept driving me forward. I was darting in and around the other runners, again not allowing anyone to pass me. My friend Dawn, the ninja-like heroine who seemed to pop up at every point on Friday, was standing between the 12-13 mile point and when I saw her I shouted “How badly do I want this?”. She didn’t hear a word because of the wind (!) but it was enough to spur me on to try and claim my PB. Then I saw my daughter, Michelle, in the finishing strait. She is my reason for coming to Hastings – there are much easier half’s out there – and, again, that gave me the boost to dredge up some more energy from somewhere. I wanted to do this for Dawn. I wanted to do this for Michelle. The hugs from each of them at the end suggest I did. I had nothing left as I crossed the finish line. The sheer exhilaration of smashing last year’s time and recording that new PB left me drained. I was so bloody chuffed with myself. I didn’t expect this, not in the slightest. As special word, too, for my friend Leslie. He moved to Hastings in the last couple of years so came to support me last year too. I spotted him at the same point today as he stood twelve months ago and I thought that was brilliant, it was good to see a friendly and familiar face out on the course. However, much to my surprise, he then popped up on Queensway, one of the few spectators up there … and then again on the seafront. All this support meant so much, thanks Leslie. There’s so much more I could write, about the people I met out on the course, about the support from the general public – and maybe I will in a future blog. But, for now, I just want to say I did it. I bloody well did it!!!! !